The Mystery Creek Events Centre is only 15km or a short 15 min drive from the Hamilton central business district. Although there is loads of FREE parking, you may wish to cruise the Waikato River on the way to the show on the Waikato River Explorer. 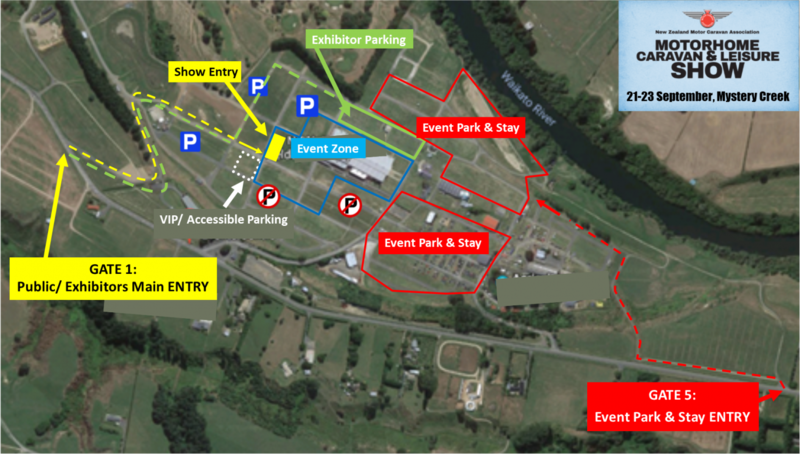 The NZMCA Motorhome, Caravan & Leisure Show is located at the Mystery Creek Events Centre, Gate 1, 125 Mystery Creek Road, Hamilton. There is loads of FREE parking on site. We have a FREE Event Park & Stay facility available for those with Motorhome or Caravans to stay onsite. Entrance is through Gate 5. Bookings are not essential, unless you require a powered site. Please visit the Event Park & Stay, page for more details. If you don't wish to stay onsite at the Event Park & Stay there are many other accommodation options in Hamilton.